As Chuck Davis, a choreographer and dancer once said that “to understand culture, study the dance. To understand the dance, study the people”, dance is a universal non-verbal communication beyond the gaps and differences between nations, cultures, ages, colors, and times. Dance is one of the most effective vehicles to artistically express inner feelings and thoughts through embodiments in a culture and society. My work focuses on making communications between different cultures, people, and unlimited imaginary worlds including unconsciousness, which is developed from my interpretation and expression of the perspectives to people, life, and culture. More specifically, my choreographic work focuses on three aspects: a connection between the past/ old and present/ new, integration of the east and the west, and communication between the real and the virtual. First, the subject matters of my creative works have focused on human-beings, their lives, thoughts, and behaviors. As today exists on the basis of yesterday and my present self is engendered from my past experiences, the past and tradition is one of the most important resources to reflect and identify the present and unlimited opportunities to create a new. Second, my dance work involves a cultural hybrid of the East and the West. This is a representation of cross-cultural dance practices and a hybrid dancing body in contemporary multi-culturalism. Through utilizing the diverse movement trainings and Laban/ Bartenieff Movement Analysis expertise, my dance project carefully considers how effectively to create a reciprocal relationship between eastern and western cultural elements. I believe the power of body knowledge gained from not learning but absorbing and exploring bodily elements, which is cooperated with some somatic approaches, such as activating breath, facilitating core strength, and re-patterning body alignment. This is a useful method to understand and compare me/ my culture and others/ other cultures and to coordinate unfamiliarity with familiarity. This eventually brings multi-cultural embodiments with a hybrid of the East and the West. Third, the idea of creating a communication between the real and the virtual goes along with manipulating performance space with technology. Through adopting a virtual world to the real stage space, a real three-dimensional performance space communicates with a two-dimensional projected space, created by technology. This also provides an enlargement of the limited theater space. Once this idea is incorporated with a cognitive spirituality, it eventually brings up an inter-changeable space and multi-dimensional rendering effect. I already started a creative project, named “Rendering” series, merging these three aspects in 2006. Rendering I and II have already been presented in Los Angeles and Riverside several times and still in progress. I and my collaborator, Sue Roginski, will continue to work on Rendering III, which will be presented in July 2009. My dance project, “Performativities: Tal: Masks” is a dance of indicating multi-personas in individuality. This project is a recreation of a traditional Korean Mask Dance (Tal-chum) in a westernized modern cultural perspective with an interpretation of diverse characters in self. This project will encompass multi-cultural embodiments incorporated in the socio-political concerns on body and bodily behaviors in a modern society. In the traditional Korean folk culture, mask (Tal) dance of the low class people was often used for criticizing the lives of the upper class people by mimicking and making fun of (satire) their movements and behaviors. Because of the function and effect of the mask, performers could move and act much freely and spontaneously. 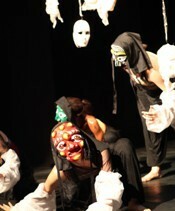 During the performance, the performers bring another persona in the role of a mask and indirectly experience other people’s lives along with the imaginary role play. In this dance project, the idea of masks and mask dance and drama is reinterpreted with perspective of “performativities” in the everyday lives of most people, like us (You and I). We are always performative in most situations and perform several different roles and diverse personas. For example, in my case, as a woman, dancer, choreographer, teacher, wife, and daughter, I play several different roles and almost always perform these roles in my life. My movements and behaviors change, according to the role I play in, at the moment. Thus, we almost always live and act with diverse performativities. This project is a movement role play of several personas in/of the self with borrowing the setting of mask dance in traditional Korean culture and re-finding diverse performative personas with various movement characteristics. Along with performing with several different masks, performers will show diverse movement characteristics, various personas, and performativities, as at every moment most people decide and perform what to do and not to do and how to act and react. This will be a mask dance with a western twist and movement play in diverse characteristics. Moreover, this project will also embrace social concerns in a relationship between the gender identities, body and bodily behaviors and reality and virtuality. Also, this will be a modern embodiment and multi-cultural recreation of Korean mask dance (Tal-chum). According to Choi, the dance is about reviewing one’s life, about externalizing imaginary worlds, and about using the body as a creative tool. Indeed, watch how the dancers begin to paint themselves and their life journeys and the canvas beneath them as the music progresses. The colors used are red and black, representing life and death-two aspects of reality all living beings must experience. This project is a solo dance revealing spatial transformations created by the interactions of real and virtual bodies and movements. This dance involves a performer’s real body movements, her virtual movement variations in the film, and another version of movement variations exposed by the movement shadows. The three movement variations create a connection between the real and virtual body and a spatial transformation from the theater space into two and three dimensional space exchanges. Along with the spatial transformations, this dance feature also reveals a conversation between the past and present time. The space in the film could signify the mover’s virtual world symbolizing a past memory, illusion, or another perspective on the self existing within her psychological unconsciousness. In the beginning, the dancer languidly moves against a pastoral background accompanied by ambient electronic music, composed by Rene T.A. Lysloff, professor at University of California, Riverside. This section depicts a dreamy, almost trance-like state of consciousness in which illusion and reality are nearly inseparable. The dancer (live and in the video projection) then slowly awakens, reborn, from her dream, her increasingly energetic movements. This dance talks about the life and birth related to some questions; where I am from and where I am heading toward, which reflects my psychological state of revisiting a past memory about my shelter, mother’s warm womb where I am from (with a heart warming feeling).